After the Sabbath, as the first day of the week was dawning, Mary Magdalene and the other Mary came to see the tomb. And behold, there was a great earthquake; for an angel of the Lord descended from heaven, approached, rolled back the stone, and sat upon it. His appearance was like lightning and his clothing was white as snow. The guards were shaken with fear of him and became like dead men. Then the angel said to the women in reply, "Do not be afraid! I know that you are seeking Jesus the crucified. He is not here, for he has been raised just as he said. Come and see the place where he lay. Then go quickly and tell his disciples, 'He has been raised from the dead, and he is going before you to Galilee; there you will see him.' Behold, I have told you." Then they went away quickly from the tomb, fearful yet overjoyed, and ran to announce this t his disciples. And behold, Jesus met them on their way and greeted them. They approached, embraced his feet, and did him homage. Then Jesus said to them, "Do not be afraid. Go tell my brothers to go Galilee, and there they will see me." In this life, it is very easy to overlook spiritual realities because our senses are tuned to the material world that surrounds us. For this reason, it is important for each of us to free ourselves from sensory overload and quiet our minds to hear the voice of the Lord, who often comes to us in a “light, silent sound” (1 Kgs 19:12). However, our heavenly Father, the creator of all things, visible and invisible, can also use the material world to emphasize the spiritual. Such an event occurred on Golgotha, where St. Matthew tells us of the chaos that surrounded the death of Jesus on the cross: The earth shook, rocks were split open, and the tombs of the dead were opened (cf. Mt 27:51-52). Standing by Jesus and witnessing these frightening natural signs, a centurion and his companions could not help exclaiming, “Truly, this was the Son of God.” (cf. Mt 27:54). The death of Our Savior on the cross was a spiritual triumph over sin, and God exclaimed this victory to the world using tumult of the physical world. However, after the commotion, silence fell over the land, reflecting the immeasurable sorrow of the death of Our Lord. Solemnly, the body of Jesus was taken from the cross and laid in a tomb, and a large stone was rolled across the entrance. 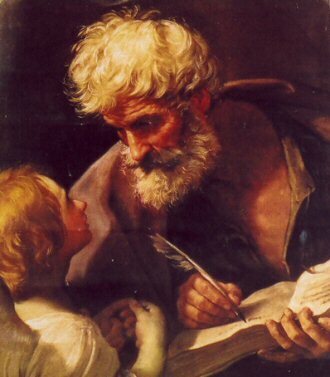 St. Matthew tells us that when the preparations were complete, Mary Magdalene and Mary, the mother of James and Joseph, remained sitting across from the tomb, staring at the spot where their teacher was laid to rest. No further details are offered, and we are left to wonder just how long these two women sat there side by side, looking at the tomb, heartbroken and confused at their incredible loss. These same two women, still drawn to the tomb, appear again in St. Matthew’s Easter morning narrative. Dawn is just beginning to break as they make their way to anoint the body of Jesus (Mk 16:1). Everything around them is silent and still, when suddenly, an earthquake jolts them awake. As the earthquake on Good Friday announced Christ's victory over sin, this earthquake proclaimed that death was vanquished as well. “Do not be afraid,” an angel tells the women. “He is not here, for He has been raised just as He said. Come and see the place where He lay” (Mt 28:5-6). While the women were undoubtedly confused and unable to grasp the message of the angel, we know through faith and the message of salvation this was an event that changed the world. We can forgive Mary Magdalene and her companion for their bewilderment, for nothing like the Resurrection had ever happened before, or even been dreamed of in the mind of man. Certainly the Gospels offer us occasions when a dead person is brought back to life through the intercession and power of Jesus. However, as God, Jesus alone has the power to raise Himself from the dead (Jn 10:18). Not only that, Lazarus and those whom Jesus raised to life all eventually died again. However, the Resurrection of Jesus is eternal. He has put an end to death and opened the door to everlasting life in heaven. The resurrection of Jesus from the dead on Easter morning is something completely different, transcendent and mysterious. While the Resurrection is an historical event that took place thousands of years away in a city thousands of miles away, its meaning touches each and every one of us today, for it is through the Resurrection that our lives “are swept up by Christ into the heart of divine life” (Catechism of the Catholic Church, No. 655). We are swept up beyond the things of this world, swept up into His grace and glory, and swept up into the promise of everlasting joy of life with our triune God. It is easy to miss the significance of the Easter triumph, even on the day we celebrate it. The Easter holiday, like so many other days, is full of activities that distract us from the spiritual life. God-willing, we will be spared an earthquake to jolt us to the tremendous truth of the Resurrection. Let us be swept up into its truth, beauty and joy this Easter, that we may be awakened and transformed as followers of the risen Jesus.